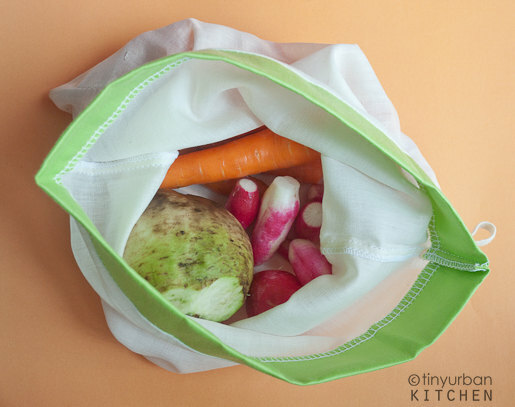 Reusable Produce Bags + Giveaway! Plastic bags have gotten a bad rap lately, with Whole Foods giving it up completely and San Francisco banning it outright. It’s true, plastic bags take tons of petroleum per year to manufacture, plus they take a loooooong time to degrade and cause damage to marine life. Yet an average paper grocery bag takes four times as much energy to produce (~2500 BTU vs. ~600 BTU per bag), and think of all those trees that are being cut down. In the end, unfortunately, neither are really ideal. Many have argued that reusable bags are the way to go. They are . . . if you actually are diligent about reusing them. I’ve struggled with this issue a lot myself. I see a lot of these cheap, “reusable” bags that they sell in supermarkets these days, and I wonder whether they were ecologically made. I also wonder how often they are used versus how often they are thrown out, either due to their cheap quality or just because they are not being used. The solution doesn’t seem nearly as simple as it might look. And that’s just the grocery bags. What about all those little plastic bags that you use to carry your vegetables, fruits, and nuts in the produce aisle? I must confess, I love using those little plastic produce bags as liners in the little trash receptacle that sits on my kitchen counter. I can sort of see why plastic recycling is so low in this country. I think (or hope!) that part of the reason is that most people reuse these bags at least once, and more often than not as trash bags. But if there were another alternative to these little plastic bags, would I consider it? When Lacey from A Greener Kitchen contacted me about trying out their organic cotton produce bags, I was definitely intrigued. Even though I had always tried to use reusable shopping bags for my groceries, it never occurred to me to avoid plastic with my fruits & vegetables in the produce aisle. I agreed to try them out for a week. I like the idea behind these bags. The company makes these bags using leftover scraps from organic cotton aprons that they also make. What a good use of extra material! They even make sure that their print fabric comes from an eco-friendly textile company. I tried these out for a few days and overall I liked them. They are attractive and work pretty well for produce of various sizes. You can close the bag by cinching the top and sliding the attached elastic band around the cinched portion. Although I have yet to wash them, the company recommends hand washing and air drying them (for environmental reasons!). They look like they would dry pretty quickly, as they are very light. There were a few negatives. I didn’t like how I couldn’t see what was inside the bags anymore. It made it a bit harder to figure out what produce I had. I found myself opening up the cinched bags in the fridge to see what was inside each one. Plus, they aren’t really waterproof, so keep that in mind. The bags got slightly wet from the damp vegetables that I put inside. I probably wouldn’t ever use these bags for raw meat. I also instinctively wished for a draw string instead of the cinched elastic. I think it would be easier to open and close quickly. This is personal preference; the cinched elastic worked fine. Lacey has generous agreed to give away a set of reusable organic produce bags (pictured above – value $14.95). There are three different sizes. The large one works well for large vegetables (I put Swiss chard in that one). The medium one works great for a bag of fruit or potatoes. The smaller one is good for something like nuts. 1. Comment below telling me one thing you think you could do (that you don’t do now) to help the environment. 2. Tweet or blog about this giveaway (please link back to this post and leave a comment telling me where the post is!). Thanks! Good luck and I will do the drawing on Thursday at MIDNIGHT! Disclaimer: Time to time I receive free products from vendors to review. I do not receive any payment for these posts/reviews. The views expressed in the posts are completely my own. 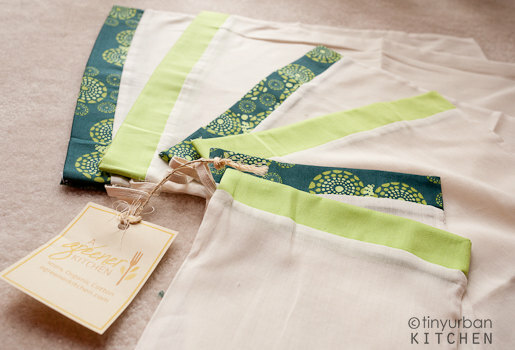 For this post, I was given a chance to review a free set of reusable produce bags (pictured in the post). I’m waiting for NYC to be a no-plastic bag zone – or at least be like Toronto where all plastic bags costs $0.05 which makes people use less. I too am guilty of using plastic bags for produce despite using cloth bags for groceries. With these bags, I would definitely use less/no produce plastic. I just re-tweeted your giveaway. I could definitely convert my toilet to low flow. I definitely use way too many paper towels. I try to recycle and be green in other ways, but I haven’t really found a replacement for the convenience of paper towels. I could really use those bags as I get a lot of produce with my CSA – but don’t have any bags to put them in! This would be perfect! I would like to change out my water heater to a tankless water heater. Thanks for this giveaway…I definitely want to use more organic products in the future as I am not doing that right now….hope I will gradually improve.. Thanks for the giveaway. It’s a great idea. I can be more conscious of what I eat in terms of where my food comes from. Buying local products reduce transportation costs/distance which means less pollution and smaller carbon footprint. I can definitely do better with leaving things plugged/on in when not in use. And I am all about the public transportation. Thanks for the give away – I would really try harder to remember to take my bags into the store to use – not remember when I’m checking out. Great giveaway!! Thank you!! I’ve been working on using my bike more often then the car. I should definitely be more aware of my water use, especially since we just moved to SoCal! I wish I could remember to actually unplug things like lamps and power cords, since I know they eat up electricity even when they’re not attached to something that’s sucking juice out of them. I’m trying really hard to be better about it! I will try not to turn on the AC unless the temp is over 90.
thanks for holding this wonderful giveaway! your post also gave me a lot of food for thought in terms of thinking about how to be eco-conscious in a more holistic way. one of the things i would love to start doing is to create my own compost. it would greatly reduce my garbage load and go towards creating something beautiful! I will walk whenever I can, it’s good for the environment and it’s good for my health. Now that i’m living in Cambridge w/o a car, I’m walking everywhere, which is wonderful. I also have completely switched over to only using reusable bottles instead of buying bulk bottled water all of the time. Start composting, or at least save my kitchen waste and bring it to the community compost at Whole Foods! I’m on week 4 of adopting a pescaterian diet. no more red meat for me! Nix all the plastic water bottles and make better use of my klean kantene. On the go, at work and especially while traveling. Tweeted about the giveaway over @ illegirl. Um…I could probably use more reusable grocery bags. I always bring a canvas tote with me when I shop, but I’ve only got the one, and end up returning from the grocery store with about thirty plastic bags. To help the environment more than I already do I could start a personal compost. I was used to having a local one and since I moved and live in an apartment I haven’t been able to, but I could find something balcony friendly for the summer at least. I could definitely take much shorter showers than I do, and use less hot water. It’d probably end up being nice and refreshing anyways with the nasty summer weather around here. Very doable. I should use reusable water bottles more often. Thanks! I definitely want to switch our toilets and showerheads to low-flow models. These reusable bags are a terrific idea! I like that they were created from organic cotton, and look so cute that you wouldn’t be embarassed about bringing them out at the farmer’s market. The best thing I could do right now is be more pro-active in using bags like this. I try to avoid single serving beverage bottles, already have all the light bulbs replaced with flourescents, drive an old car that gets great mileage and paid its carbon debt a decade ago. I also started eating less meat. Not going to give it up, but I guess that would be a good place to take some further action. nice giveaway! I would be better about bringing my reusable bags to the market and try to bike to places whenever possible. thanks! I try so hard to avoid plastic bags when shopping, but when it comes to produce, i tend to use them to avoid just putting stuff bare in the cart. would LOVE to try these! I’d also like to borrow more from the library rather than buy my own books. I could compost… or I could use biodegradable liners in the kitty litter box. If I can get some help, I’d really like to install some solar panels on our roof and/or even indoors. We get so much sun. Using reusable produce bags is definitely something I could do that I don’t do now. I’ve been wanting to collect rain water for my garden — that’ll be our next step. My wife and I have started to be more eco-friendly and everyday we go through a lot of plastic and paper bags that can’t really be reused. We thought that getting some reusable bags for when we bring lunch to work and for our kids to bring to school to pack their lunch in that would be a great idea and it would be very helpful to the environment. We found that http://www.oneclickdirect.com had the perfect product at a very affordable price. My wife found that they had 100% Organic Snack Bags. These are great for when you pack your child’s lunch for school and even your own for work or if you want to keep something fresh and let it sit on the counter or in the fridge for a while and come back to it later. I highly recommend this product if you too are looking to be more eco-friendly and looking for products like this. I even recommend it if you’re trying to be eco-friendly and don’t know where to start, this is a really good start to being more environmentally friendly!! I love the idea of produce bags , I already using cloth bags for shopping, and now we want to start our own veggie garden since we have a compost bin. I saw the cloth napkins and definitely we will star using them,.. If you do your research on how much waste a person does, and how much take to make, paper napkins, paper towels, you can see that a small personal or family change can really improve the environment.